For quite a while now I try to catch a signal of ISEE-3. Because of severe thunderstorms, there was no opportunity to check out yesterday. But today (July 30th, 2014) is the day to listen to this 36 year old bird. 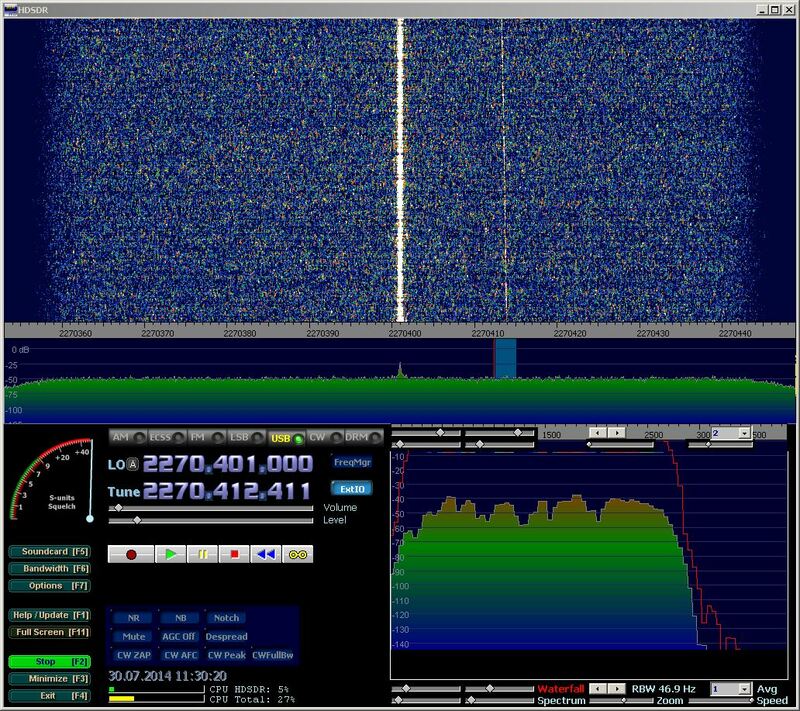 The signal of the beacon on 2,270.414 MHz isn´t too strong, but clearly audible in the speaker. The actual distance is about 1.6 million km, the furthermost man made signal I ever received! The downlink transponder A on 2.270.4 MHz uses an antenna array with a gain of 7 dBi, a beamwidth of 12° and circular polarisation. The nominal TX power is 5 W.
The equipment I am using, is just a FUNcube Dongle Pro with a 13 cm ATV converter (LO 916 MHz, IF 1,354 MHz) and a 13 cm LNA near the 23/13 cm dual band ringfeed at my 3 m dish. Frequency calibration is performed on ordinary 13 cm beacons like DB0UX. The dish calibration is done by optimizing sun noise on 23 cm or the levels of SIRIUS satellites on 13 cm. The rhythmical fading of the signal seems to be caused by the space probe´s spin of 19.76 revolutions per minute. This entry was posted in Beacons, ISEE-3, Satellites and tagged 13 cm, 2320 MHz, Amateurfunk, beacons, dish, DJ5AR, Doppler, Funkamateur, ICE, ISEE-3, Mainz, Microwaves, Parabolspiegel, Radioamateur, Spacecraft on 2014-07-30 by admin.